For 10 children from the poorest families, we settled half of their fees. Another 15 children received between 1/3rd to 1/8th of their fees as a contribution. 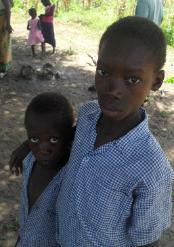 available, 16 more children decided to join Secondary School since. Would you like to help the children of Mida? further education. Yet, children want to go to school - it is a privilege for them if they can. help a desperate child and the school at the very same time. I have now started collecting for Term 2, starting in April 2011.
front of the teachers, students, Mida Ecocamp elders committee and myself. Secondary School, year 3 and 4: Year 3 will only start in 2012 and year 4 in 2013. Primary School is government funded. usually drop out in year one as they can not catch up. Hence 150 children in Mida Village do not go to school at all. (back, right), teacher Ngate (front right) and myself in January 2011.